Overview : Finally a solution to your broken UMD games & movies. This nearly indestructible UMD repair shell is a replacement case carriage for those flimsy UMD shells that the game is originally contained in. Stop throwing out your games & start playing & watching all your PSP UMDs again! Quality/Usability : I know everyone had at least one horribly scratched up UMD disc or a UMD disc that has cracked. With the item being damaged, it either wont play or you had to go out and buy a new game/movie. Now, there is a solution that Sony failed to provide whether it be replacement cases or better quality product. Multimedia Recovery has filled that void by releasing a PSP UMD Replacement Case. The size is replacement case is exactly the same size of that of the original UMD case. There are some slight differences. The replacement case consists of two plastic pieces (front and back) while the original consists of multiple pieces. The replacement case snaps on and uses a screw to hold the cases together tightly and the replacement case comes in multiple colors. To install, simply remove the disc from the original case. 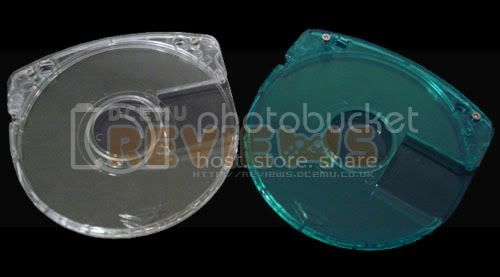 Place the disc on to the bottom replacement case and then place the top replacement case on top to encase the disc. All you have to do now is press all around the replacement case to ensure that it is in place and complete the process by screwing in the small screws. You can use a screwdriver similar to the ones used for glasses to tighten the screws. Multimedia Recovery offers two types of cases; screw and snap-on. We only received the screw version so we are unable to give a review on the snap-on version. Some colors they currently offer are clear blue and crystal clear New colors will be available soon such as purple, red, yellow, multi-color, metal flake, pink and black. Conclusion : Overall, the Multimedia Recovery PSP UMD Replacement Case is probably the only replacement UMD case on the market right now. The replacement case is durable and will not fall or break apart unlike the original case. The price is very cheap at $3.99 including free shipping within US, $4.99 including free shipping Internationally and $11.99 for a 3-pack. Its definitely better than spending $30 on a new game or movie. You can also swap disc with the replacement case but be sure to handle and place the UMD disc carefully as they are not well coated to begin with. Quality/Usability : Multimedia Recovery was nice enough to send us the snap-on version of the PSP UMD Replacement Case. The snap-on version is identical to the screw version. Only difference, its snap-on and does not require a screw. Game discs are held securely in place. The replacement case has 7 pegs all around the case that holds the top and bottom casing together. Only problem with these pegs is that they bend easily as they are plastic, small and thin. So if you're closing up the case and just so happen to close it wrong, you may end up bending the pegs. This can be easily fixed but using thin pliers or something to shift it back in place. By doing this, it will weaken the plastic. Even if you were to break it off or if it breaks off on its own, the replacement case is still held in place tightly. Conclusion : Overall, the snap-on PSP UMD Replacement Case works just like the screw version. Just remember to be careful when closing up the replacement case so you dont bend one of the pegs out of place.